Searching for brilliant ideas to get noticed? People are familiar with Post-it® notes. Research shows they that will use about 8 sheets per day and that about 4 people see each sheet of a Post-it® note pad. Stick with the brand that has over 90% awareness in Australia. The Post-it® brand! Post-it® notes offer an imaginative way to reach your target! Used by millions everyday... Nobody throws away a Post-it! 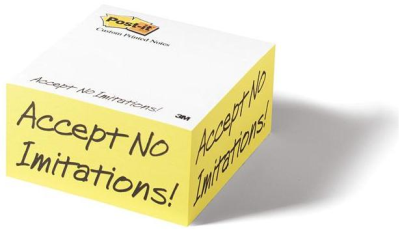 Custom printed Post-it® notes are the genuine article - we could market an inferior range of 'sticky notes' but choose to sell the world's leading brand of notes that keep on sticking. Please beware of non-brand notes - they do not use the patented 3M process, use less glue adhesive and simply don't stick around as long! Why would you lessen the impact of your marketing campaign? Post-it® custom printed products are ideal for sales calls, gifts, trade show giveaways, business forms and much more... We want to make your campaign a successful reality... simply phone us, contact us by email or complete a quote request form.